On behalf of Metrolinx, we’re designing and constructing the Finch West LRT Project along Finch Avenue West in northwest Toronto between Keele Street and Highway 27. 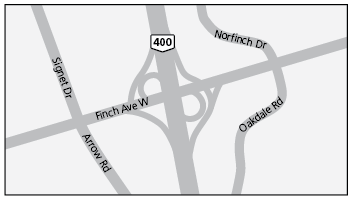 We are designing and constructing stops, a maintenance and storage facility, tracks, communication system, and other required infrastructure, including upgrading and rehabilitating the Highway 400 Overpass at Finch Avenue West. Rehabilitating the Highway 400 Bridge is essential to the future operations of the Finch West LRT alignment. This is because the LRT line will pass below the bridge and have its eastbound and westbound LRT track alignments on either side of the bridge piers. Further, rehabilitation works will improve the aging bridge’s infrastructure, providing further protection to motorists travelling on and below it. Mosaic Transit Group is committed to mitigating disruptions to motorists, transit riders, businesses and the general public. As a result, we will use a Rapid Bridge Replacement technology to rehabilitate the Highway 400 Bridge at Finch Avenue West. The Rapid Bridge Replacement process will consist of fabricated bridge elements that are constructed in adjacent laydown areas throughout 2019 and 2020. The innovative technique will reduce the duration of traffic disruptions to motorists from many years to several weekends and night lane closures.